And that ONE is YOU! There’s a 99.999999% chance when you wake up tomorrow you name, and picture will not appear in newspapers and television sets all over the world. But your life will still have had an impact on the world and it will be changed even if that change is like a drop of water into an ocean. Your greatest gift to a world in chaos and turmoil is YOU. A smile, a hug, a few encouraging words and suddenly the world of TWO (or more) has been changed. There are even times when not a word need be spoken just your compassionate presence will make a difference. I have a little secret to share with you. But when I tell you you’ll no doubt say, “That’s no secret I’ve known that for a long time.” You are not a world of ONE! While you are one person you have not lived your life alone you have your family, you have your friends, you even have your enemies, you have a history with the world at large, and more importantly you have your relationship with God, Jesus, and the Holy Spirit. 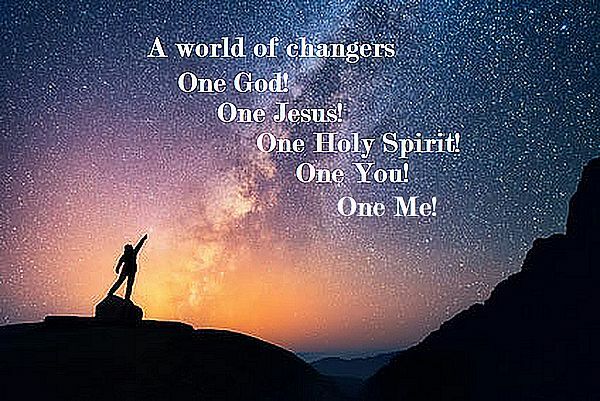 One last thought if you as ONE change my life and if I as ONE change another life of ONE and that ONE changes the life of another ONE and that process continues before long it’s not just a world of ONE that is changed but an ENTIRE world of ONE’s! And just think all that started with ONE – YOU! And when that one doesn’t share him/herself with another, God will find someone who will. Guess who misses out on the blessing of being used of God. Right! The one who doesn’t share.As we have freely received may we faithfully and freely give. Enjoyed your post. You are so right! I often look back and wonder if I have missed out on a few Blessings that way. One day I suspect will will find out, we all will for that matter when we stand before God and give and account of our life. Thank you for your comments and support! God’s Blessings on you! Thank you and praying God’s blessings fill your life, as well.